Digital certificates will be automatically issued upon successful completion of the assessment. Please allow us to send it to your email within seven days. Instructions for the printed certificate can be found on the page of each course. If you have further questions on the certificate, please post your question on this post. This entry was posted on Wednesday, January 26th, 2011 at 9:24 pm and is filed under Uncategorized. You can follow any responses to this entry through the RSS 2.0 feed. You can leave a response, or trackback from your own site. Wish to know if Digital certificates will be automatically issued upon successful completion of the assessment or individuals have to request for it. Thank you for using the UNPAN Online Training Centre! Digital certificates are automatically issued within 7 days of the successful completion of the assessment. 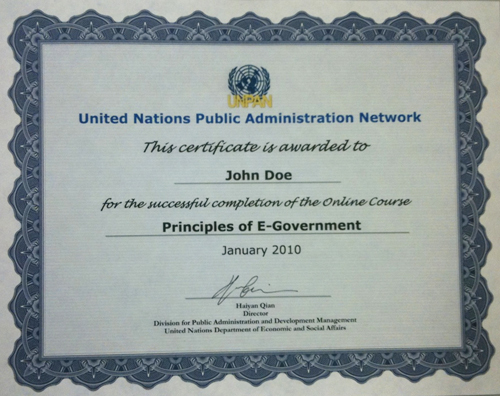 I’ve successfully finished four online courses of the The UNPAN Online Training Centre (Principles of E-Government, Infrastructure for E-Government Development, Strategies and Methodologies for E-Government and E-Government Interoperability ) more than a week ago, but I haven’t receive my digital certificates yet. Is everything alright with that? Your certificates were sent today. I apologize for the delay. My Name is Hubert T Mupedziswa and I successfully completed 2 courses more than a week ago, (Capacity Building & MDGs) but I havent yet received my digital sertificates. Is all well? The certificates will be sent today. I apologize for the delay. My name is Fernando Laguardia from Zaragoza, Spain. I work as a civil servant for my regional government. For the certificate to be useful I need to reflect a number of hours of dedication, is this possible? It could measure the number of hours needed to complete each course and reflect on the certificates. Unfortunately we cannot include the hours of dedication in our certificate. I apologize for that. Thank you very much for the guidance, thanx for your guidance, It is so good wonderful today, I have managed to have pass Strategic Intelligence above the 60% mark, actually, am excited this time around, this is such a very interesting programme. kindly email to me to certificate to enable me to print it. You certificate was already sent to your email. Thank you very much for the guidance, thanx for your guidance, It is so good wonderful today, I have managed to follow the instructions you gave me, by using a different email account, re-sat the e-learning course and have passed above the 60% mark, actually, I was just more than ready to re-take. While viewing preparing to print my certificate of award, there was a power failure within our area, but now it is rectified and back, kindly how can I access it (certificate) and print it from the UNPAN website. Thank you for your interest in our blog. Of course you can quote the articles on our blog with the proper citation. Since all our blog inputs were provided by UNPAN users, pleas make sure to include their information to each corresponding article as well (their information can be found at the end of each article with their name and city/country). Great web site you have here.. It’s hard to find high-quality writing like yours these days. I honestly appreciate individuals like you! Take care!! i took an online course on democratic governance but i scored below 60%. Please i need to retake the quiz. How do i do this? Dear Therese, all learners are encouraged to retake the course 2 months from your first exam date. Good luck! Congratulations on passing the course and thank you for your submission. You certificate was mailed today. I would like to ask one thing. Basically I am in my first year of my masters in Public Administration and in addition to this, I wish to do the strategic excellence certification from UNPAN. As I am not employed then Am I eligible for this or not? UNPAN Online Training Centre is open to all and there is no prior education background or work experience required. And it’s free! thus far? I surprised with the analysis you made to make this particular submit incredible. Dear, i have not found my score after the assement of “RBME for MDG implementation”. How to know my score while waiting the transmission of the digital certificate. The score would be showing right after the exam. If you score 60% or above, the certificate will also appear on the screen. can u pls tell me if the exam score would be mentioned on the certificate? Hi Coco. You will receive a certificate if you score 60% or above. The score will not be shown on the certificate. then will I get five certificates? and Can I get only Certificate in E-Government comprising these subjects instead of 5 pieces of certificates? and … Am I supposed to submit the 2500 words letter for each subject? or Just One? Hi Myo, you will need to provide at least 2 submissions if you complete 2 or more of the above courses. You can use difference cases or examples in each essay. Please also note that the essay requires 2500 characters (not words).